I recently finished university and got a job which has increased my cash flow quite a bit. Beside putting some money aside I also decided that it was time for some new gadgets. Below is the items I have decided to buy, but if I could justify the expense I would also have bought a Intel X25-M Mainstream Solid State Drive – 34nm Product Line 80 GB for the 200MB/s throughput and a Samsung SyncMaster 2233RZ for the 120Hz. I have a server with all my home files shared through NFS and for a while it has annoyed that 100Mps networks only support around 12MB/s when working on images and doing backups. So I decided that a Gigabit speed was about time. I would have loved to have all 8 ports in a router but such routers are expensive and I would most likely have had to give up the DD-WRT firmware which I enjoy on my WRT54GL. I chose this over switch over some less expensive models as it is reported to have great performance and not to get as hot as other models. There you have it. 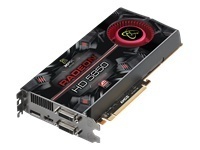 A week after introducing the Radeon HD 5870, AMD is ready with the more affordable Radeon HD 5850. It is not the barn-burner that the 5870 is, but for the money, the Radeon HD 5850 is supremely attractive. Gamers in the market for a powerful graphics card, that supports all of the latest technologies, need look no further. The ATI Radeon HD 5850 currently provides the best performance and feature set at the sub-$275 price point. The entire 5800 series is forward looking as well, supporting DX11. We think the ATI Radeon HD 5850 is “THE” next-gen video card that gamers and hardware enthusiasts are going to flock to. The result of this is clear: the 5870 is the fastest single-GPU card, and the 5850 is the value alternative. Couple that with the fact that it’s cooler running, quieter, shorter, and less power hungry, and you have a very interesting card. So the bottom line is really simple: with the Radeon HD 5850 you gain a lot of features and will play your games at really good performance levels. There’s very little to dislike here as not only do you have a state of the art graphics card in da house, you’ll also have a very wide feature set available which is future proof. If your upgrade path is worth USD 259,- the Radeon HD 5850 comes very much recommended in our book. After looking at the HD 5870 so many times I was feeling pretty confident that ATI were going to deliver with the HD 5850. The good news is they did. Really, like the HD 5870 we can see for the most part it’s able to pull out a win against the GTX 285 which is NVIDIAs top single GPU graphics card. Wauw that is really interesting and good upgrade. Then only think I would have to investigate if it is capable of routing more than a 30/30 mbit connection. Most consume-grade routers can handle really high-speed internet. I have a 50/50 mbit and the DD-WRT WRT54GL can’t provide more than just over 3MB/s both ways.